In a medium bowl, combine 1 cup chocolate chips, 1 cup coconut, pecans and 1 egg; set aside. In large mixing bowl, combine 2 cups of the flour and salt; set aside. In small bowl, heat the half and half to 110 to 120 degrees F. Mix in the yeast; set aside 5 minutes, or until bubbles form. Add the coconut oil and honey. Mix well, then add to the flour mixture. Beat until smooth; then mix in remaining 2 eggs until blended. Stir in enough remaining flour to form a soft dough. Turn onto lightly floured surface and knead just until smooth and elastic, about 6 to 8 minutes. Cover and let rest 10 minutes. Onto a lightly floured surface, roll dough into a rectangle (18 x 10-inches in size). Melt remaining tablespoon coconut oil and brush over dough. 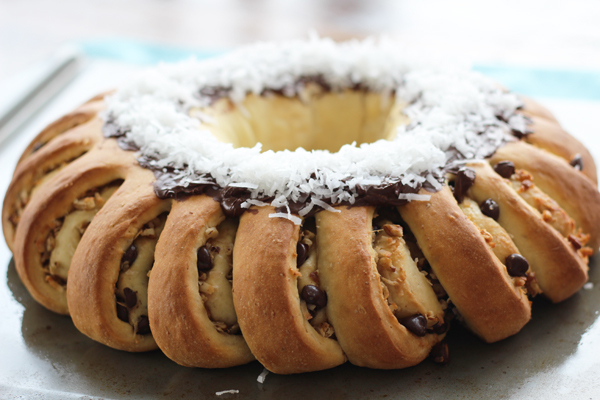 Spread with reserved chocolate-coconut mixture, leaving a 1-inch exterior border. Starting from the long side, roll the dough jelly roll style. Pinch seams to seal. Place dough seam side down on a greased baking sheet. Form a ring by pinching the ends together. With sharp scissors or knife, make cuts at 1 inch intervals, from outside edge to inside ring edge. Separate strips slightly to allow filling to show. Cover and let rise until doubled in bulk, about 50 to 60 minutes. Preheat oven to 350 degrees F. Bake 40 minutes or until golden brown. Cover the ring with aluminum foil if needed to prevent over-browning. Fresh from the oven, press remaining 1/2 cup chocolate chips on top. Once melted, spread with a spatula. Top with remaining 1/2 cup coconut. Carefully remove from pan to a wire rack to cool before serving.